A good sunny day but a bit on the chilly side, with the Temora clubs in the finals on the same day the crowd was down, but a good day was had by those who came to witness both finals. 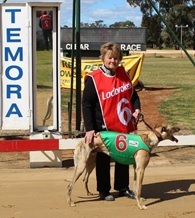 Race 1, GBOTA Maiden 330m saw Gillian Apps of Wombat win in 19.74 by a neck to Dana Skye and Stay Rich. Race 3, (presentation pictured left, race photo bottom) Railway Hotel Maiden Final over 330m saw a good field go to the boxes, Cash A Roo was the favourite with the locals being a local dog, but it didn’t get its own way as they jumped and the leader changed a few times before they headed into the home bend, cash a roo was up there with them but the bookie favourite paying 3.40 flew home at the last moment to win. Durama Magic won in a time of 19.56 for Stephen Cleary of Mandurama, winning by 3 ¼ lengths to Mary’s Desire for Terry O’keefe of Cootamundra and Cash A Roo for Max McGovern of Temora, A good race and a good finish. 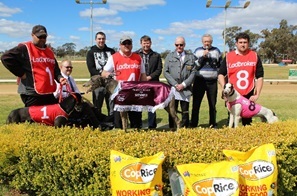 Harry Wilson from the Railway Hotel was there to watch the event and at the presentation to the winner and place getters of a bag of dog food. 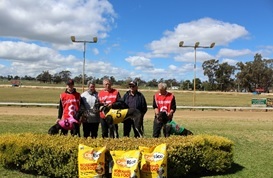 Race 5, Temora Ex-Services Club Final, (presentation photo right) 457m NG event saw a full field of good dogs walk to the boxes, two favourites were Beegumbah Rumba at 1.60 and Ding Ying at 2.70. They jumped and Beegumbah Rumba went to the lead only to have Budge, Wild Josh and Who Said That hot on its heels with anyone of them looking like winning. Plenty of cheering going on as they ran up the home straight and past the finishing line, it was a wait to see who won as two of the dog were close at the finish. 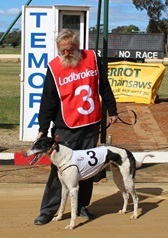 A neck separated 1st and 2nd, with Who Said That winning for local Temora man Max McGovern in a time of 26.89, beating Wild Josh for Perter Scott from Junee and 3rd Budge for Dirk Bosman from Holbrook. Who Said That paid 4 dollars with the bookie. A delighted McGovern family went to the dias with the representatives of the Temora Ex-Services Club, President Gary Whitely, Secretary Ben Wells, Jason Smith and Michael Floyd. Bill Schwencke co- Greyhound Club President spoke about the club’s support of the race saying this was their 40th year of sponsoring this race, then handed over to Gary to speak and congratulate the winner while Jason rugged the winning Greyhound. 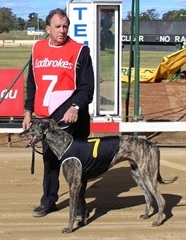 Race 8, Temora Shire Council 330m, had Ted Winters dog Fully Gwarnified of Cootamundra, win in 19.59 by 2 ¾ lengths to April’s Melody and Best On. Race 9, Living and Giving stake 457m saw Blazing Bullet win for Suzanne Steadman of Kingsvale in 27.21 by 2 lengths to Hide The Kitty and Mix Up. 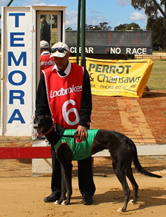 Temora don’t race now until 21st October with heats to Bulli TAB and Temora Shire Council 570m race. Hope to see you all then.